Lenore Appelhans has her own debut called LEVEL TWO coming out fall 2012. It sounds like it will be a book I’ll devour. She also runs a wonderful website for YA books. And today, I have my first mini-interview ever there. So please check it out and leave a comment if you feel like it. 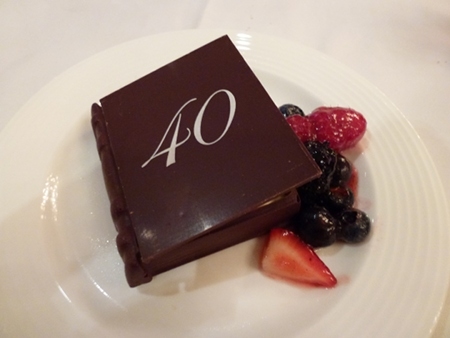 The dessert at the Golden Kite Awards at the 40th anniversary for the Society for Children’s Book Writers and Illustrators was a book (complete with binding on the side) made of luscious chocolate. The cover lifted, revealing a generous, lip-smacking portion of white ganache cream. Had an amazing time there, meeting with my fabulous Vice President, not Biden but the all-knowing overseeing editor at Random House Children’s Books, Beverly. She gave her all at the conference, sharing her remarkable experience and wisdom. I was a rockstar to my friends once they heard Beverly speak. I also met some wonderful authors and writers who will soon be authors, as well as other people who work in children’s publishing. And remember I said they would make us cry? Well, they did. Over and over. They had a stellar list of speakers including Laurie Halse Anderson and Judy Blume and David Small. And when they spoke it was with such openness and honesty and depth, revealing not only their history, but a piece of their writer’s soul. But we left inspired and enlightened, ready to go back in our quiet caves and write our hearts out. Oh, that was a tasty dessert! So glad to have met you at the luncheon, L. And to have bumped into you repeatedly for the rest of the conference. Good luck to you!